There's a scene in the new comedy THE HOUSE that features a deranged Will Ferrell wielding an axe while threatening to hurt a compulsive gambler that was caught cheating while at his own home run underground casino. I couldn't decide whether I should have found this positively hysterical or positively frightening. 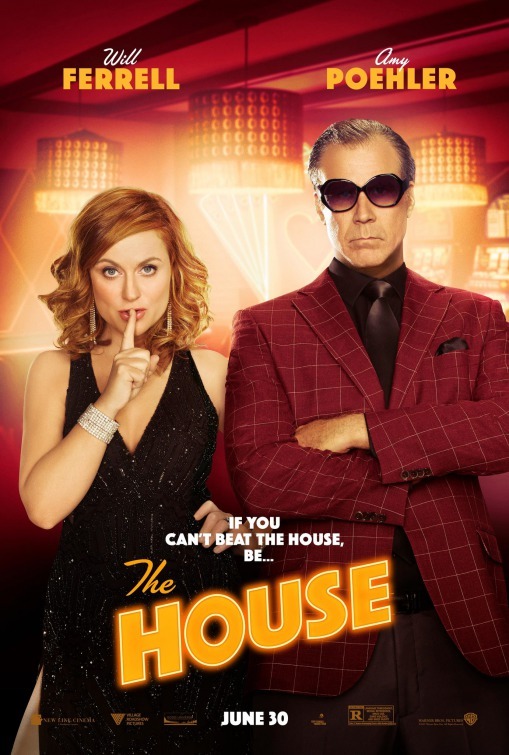 That yo-yo effect is probably the best way I can describe the entire process of watching THE HOUSE, which contains a premise with great potential for high hilarity and social commentary, not to mention that it features a relative cinematic dream-team of Ferrell and Amy Poehler, who haven't shared the screen together since 2007's BLADES OF GLORY. The two stars have demonstrated themselves to be limitlessly amusing and highly game on screen buffoons that have no problem shedding egos and making themselves look foolish to score big laughs. But the main problem with THE HOUSE - directed by NEIGHBORS screenwriter Andrew J. Cohen, making his feature film directorial debut - is that it rarely makes ample and proper usage of its star assets, mostly because the film feels like a series of sometimes amusing, sometimes flat skits than it does a fully fledged movie comedy. Considering the players involved, THE HOUSE rarely achieves zany momentum and hilarious lift-off. The arc of the film, though, is spirited enough, even though its strains modest credulity (more on that in a bit). Ferrell and Poehler star Scott and Kate respectively, a couple of loving, but fairly dimwitted parents that become elated when they realize that their teenage daughter Alex (Ryan Simpkins) has just been accepted into a very prestigious - and very expensive - college. Thankfully, the parents feel fairly secure in knowing that money will not be an object, seeing as Alex is set to be awarded a lucrative town scholarship. Unfortunately, the town mayor (Nick Kroll) decides that the scholarship money would be better suited to be put towards community endeavors...like a costly new outdoor swimming pool. Morally devastated, Scott and Kate realize that they have next to no money to send their daughter to college...and can't bare the thought of telling her the truth about their financial situation. At their absolute wit's ends, the bumbling parents seek out assistance from Scott's depressed, alcoholic, and soon-to-be-divorced pal Frank (Jason Mantzoukas), who proposes a fiendish, if not completely outlandish scheme to secure all of Alex's college money over the course of the summer: They will convert Frank's home into a lavish casino that will give every desperate gambling addicted town resident an opportunity to spend all of their money there. Using the credo "the house always wins," Frank, Scott and Kate decide to embark on this Hail Mary of a financial plan, and within no time money begins to pour in at the expense of the fanatical behaviors of their neighbors. Unfortunately, a pesky local cop (Rob Huebel) begins to smell something afoul and coaxes the mayor to find out what the trio are really up to. Of the few pleasures to be had while watching THE HOUSE I will say this: Watching Ferrell and Poehler share the screen together is an initial hoot and treat, to be sure. They bring a commendable amount of committed tomfoolery to their respective parts, and their easy going chemistry and absolute willingness to do or say anything to achieve chuckles is noteworthy. Ferrell in particular, as he has established throughout his entire career, can play idiotic losers better than anyone (he plays them so much it's cliché for him at this point, but he's so good at it that criticizing him for it seems redundant). Very few actors could make gags involving, for example, confusing a 401K retirement fund with actually having $401,000 - during one riotous scene dealing with a trip to his accountant - unexpectedly funny. Then there's the aforementioned scene later in the film - during which time Scott has fully morphed into an intimidating criminal thug that would put the bosses of Martin Scosese's CASINO to shame - that has Scott accidentally chopping off a cheater's finger with an axe, with geysers of blood being sprayed all over the shocked and dismayed dad turned mobster. Only Ferrell could make shocking scenes like this work. The secret comedic weapon of THE HOUSE, though, is Jason Mantzoukas' loveable schlub Frank, whose immediate reaction to Scott's axe wielding antics are pricelessly timed and rendered. That, and he brings another layer of droll cluelessness to the film that compliments the madcap stupidity that his co stars bring to the table as well. The supporting cast is also fine, if not a bit inconsistently lopsided when it comes to winning our immediate affection. Nick Kroll is perfectly slimy as his unscrupulous mayor, and Rob Heubel generates a few guffaws in the largely throwaway and perfunctory role of the clumsy town cop with something to prove to everyone. There's also a recurring gag between two women of the town that have a predilection to verbally trash talking each other rather publicly that culminates in the casino's first fight club. Yet, the main issue with THE HOUSE is that its premise of down on their luck suburbanites needing to fund their daughter's education by starting a secret casino could have been the stuff of hilarious satire. Any attempts at working towards some economic and social commentary here are null and void, mostly because Andrew J. Cohen favors chaos and rampant hard-R rated debauchery more than anything else here. When you think about it, the notion of parents so financially devastated that they have to resort to what Scott and Kate do would have made for a hilarious comedy that taps into working class guilt and sorrow, but Cohen is more compelled to unleash F-bomb riddled improvisational wackiness through scene after scene that never really finds its comedic groove. More often than not, for every moment in THE HOUSE that's genuinely funny there are about five more that land with a thud, which is not assisted by how the film awkwardly edits scene transitions to the point of being a hatchet job. Jokes and pratfalls can't work when a director cuts away from them so haphazardly fast that it gives no time for the audience to respond. You also know you're in trouble when comedies have to desperately resort to 25-year-old TERMINATOR movie references and little old ladies using foul language to win over our affection. THE HOUSE also has other logical inconsistencies, like, for example, why the parents just don't re-mortgage or sell their house and downsize to cover the cost of college...but then...yes...we inconveniently wouldn't have a movie about them creating a casino in response to economic hardship. Granted, trying to find earthbound logic in a Will Ferrell comedy is a fool's errand. Ultimately, I've always maintained that the best movie comedies are well oiled engines that systematically and consistently delivery laughs. THE HOUSE kind of fails that litmus test and is essentially a tone deaf comedy that squanders its stellar ensemble cast. Ferrell in particular also looks like he's visibly straining to make scenes of nothingness work here, and this film is indicative of a recent comedic cold streak for him (aside from ANCHORMAN 2 and the underrated CASI DE MI PADRE, he hasn't had a solid comedy this decade). The house, as they say, always wins, but audiences will, no doubt, be the losers while watching this.